I was trying! :) But now that the whole room is getting a major redo it was finally time to make this happen. I had a plan in place that didn't work out, but more about that in a second. You can see the difference in the two wall colors here – the one on the left is the old color, called Sisal. The one on the right (at the top) is Analytical Gray. I’m not painting the back wall above the cabinets since it will be covered (hopefully soon!). OK, so on to the build. My original plan was to just take the upper cabinet down and bring it forward. I was going to use two side panels and just attach it to those. But I could NOT get the cabinet down! It was crazy. The screws were stripping and barely moving at all, it was nuts. I was totally bummed out – I considered calling in expert help to get it down, but I knew that would cost money (although the guys we use probably would have done it for next to nothing). More importantly, I would have had to wait till they were available and I was already in this thing. When I finally decide to tackle something it has to happen right. then. So I sat down and started figuring out a new plan. I decided to keep the current cabinet where it was and build straight out from it. I knew I could reuse the cabinet doors and it would provide even more storage. I had half an inch to fill at the front of the cabinets and 3/4 inch everywhere else (the trim on the front comes out a little bit). I found trim that worked and secured it to the sides of the upper and lower cabinets. This also was important because it gave me something to screw into when I installed the side of the built in. I ended up placing one more in the middle on the bottom section when all was said and done. I tend to go overboard with nails and screws and making sure things are sturdy. I had a piece of high grade wood cut down into two pieces. The right side on the wall wasn’t as deep as the left side because there was no need for it to go under the current cabinets, since it wouldn’t be seen. The piece on the left needed to be a little deeper (as deep as the upper cabinet already hanging) so that it would go under the cabinet and cover that whole side. I hope that makes sense – it should in a minute. This is when I realized it was a good thing I couldn't get that dang cabinet out of the wall – it would have been too wide. If you don’t have a wall next to your fridge that would still be an excellent option and would cost even less. But I used up 1 1/2 inches with the side supports so it wouldn’t have fit. Next up was trimming it all out. This part doesn't look great now but I still need to shore things up, fill and then sand. When I’m done you won’t even notice imperfections. I say that to encourage you – it does NOT have to be perfect! Get the job done and fix the little things later! That’s my thought anyway, I am not a perfectionist when it comes to this stuff. At first I was going to make vertical dividers but now think I’m going to go with shelves that I’ll build and slide in instead. That way I can still access the back if needed. I’ll be able to fit SO much more up there! The best part is we can actually reach these doors! You’ll see I flipped the doors over and put the knobs on the bottom. Not sure why I installed those at the top anyway. It’s awesome to be able to just open these up and reach inside! Seriously, it just makes more sense. I could have built the sides forward a bit more but didn’t want to interfere with the doors opening. Also, I want this to work for any size fridge and this one is one of the biggest you can buy. When we replace it (unfortunately it may be within a year or two because it has had a ton of issues), I won’t worry about a slightly less deep fridge working. I’m glad I figured this out and made it happen! The cost for the wood to make the whole thing was $100 – but if you use cheaper wood it will be half of that easy. I wanted a nicer finish so it paints up well. Eventually I’ll be moving our appliance garage to the side of the fridge as well. It will be a lot easier to install now that this is all trimmed out! Have you ever tried building out your fridge for a more custom look? I love the look of it but what I love even more is that we can actually access the storage! I hope my explanation made sense – let me know if you have any questions! That door gap being different would and does bug me. Sorry Good thinking on just leaving the existing cabinet there. I hate stripped screws! I've used a pliers to grab and twist out if I can because my little stripped screw tool works about 1% of the time. I didn't even notice the gap - I had to scroll back up and look to see what was being referred to. You did a great job and the photos with your explanation make me believe I can do this as well. Thanks for the post. You did such a good job...as always! I've been wanting to do this for years as well, and will be crossing it off my list soon, too. Hooray! I really wish I had at least half your talent. smart! It looks SO good! I'm so impressed with how you jump in and do these projects yourself! It looks great! Girl, You are my Hero!! I am so impressed by your do it yourself attitude... Looks great! Job well done! Are you going to paint all of your cabinets? I think they are beautiful the way they are. I have maple cabinets in my kitchen that are stained and would like to put some kind of a wash on them because they have become more orange looking over time. I am, they are looking their age (the uppers are mostly OK but the lowers are scratched up and worn), plus I'm adding to the tops of all of them. And yes, ours are maple too and they have developed the same orange tone! If I may make a suggestion, you might want to consider drilling some holes on top of the cabinet towards the back so the heat from the motor has somewhere to go. As it is, you might speed up the demise of the fridge. Good idea, I may do that when I finish up the upper cabinets. From my understanding the gaps on the sides should be enough for the ventilation. I love it, you are amazing. Don't fridges need air all about them so they don't get overheated? I have no idea but I freak out all the time about things not having enough airflow. Very smart and yes, it's awesome when we can find 'where' we can build more cabinet space in our kitchens, lol! I have one just like yours atop my fridge and boy, do I love, love it! Congrats on a great job done!!! It looks great and the additional storage is always needed can't wait to see it finished. You do great work! Looks awesome!!! We got all new cabinets a couple of years ago from Home Depot and the lady helping us suggested we do the built in look (which we did) and I'm so glad we took her advice. It completes things. 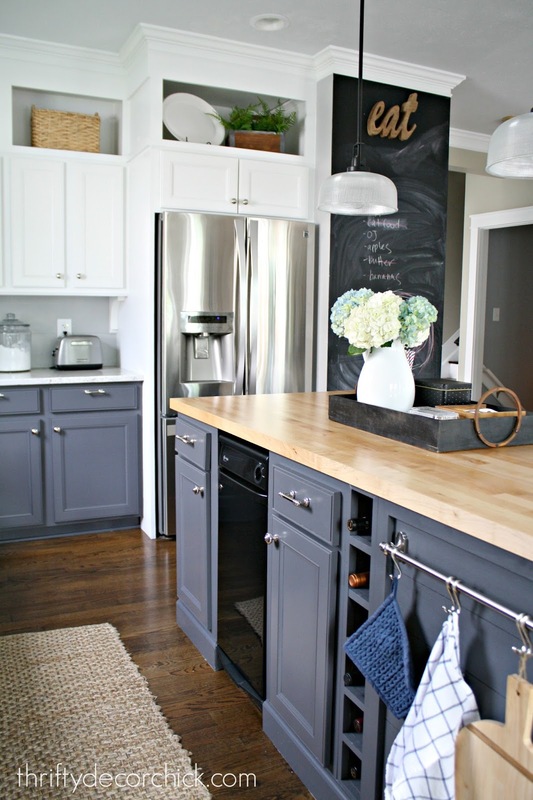 Can't wait to see the rest of your kitchen redo! You should be dang proud of yourself--you rocked it! It looks awesome!! Wow! That is awesome! You did it...just like that! I wish you would have explained more about how you made the bottom of the new cabinet and showed a pic of how you attached it and before you added the trim. I think I understand all the other parts. Don't think I can do this to mine, my pantry in the corner, is next to my fridge and it if I did it, the wall wouldn't come out far enough. I was so impressed with your island you made too! I am so glad that you posted this! We are in the middle of enclosing our upper cabinets and I was trying to figure out how to do the cabinet above the frig. We have the same scenario. We have a wall next to the frig. Now my problem is solved!!! Same here! Our bottom cabinets are wearing badly, the ones by the sink are our worst too! The amazing things you make and get done are over my head. How do you you know how to do all that building stuff? Love how your fridge enclosure looks, very professional. How do you keep your fridge looking so pretty and clean on front? It looks like your fridge is new. Love how you made cupboard over fridge look and so much more practical. You are a building genius girl. Maybe if hubs wasn't such control freak so I could try things I would. If he would just do things as I ask him to as we go along but there are always objections. I told him how somebody on blog land used laminate flooring for new counter tops, nope can't be done. I saw it done, photos and all. We have 3 boxes of laminate flooring that would work great, think he just doesn't want to try it, not have to do work. We need new counter tops something awful in our kitchen. We have horseshoe shaped kitchen. Think hubs is afraid he can't cut flooring to work on counters. Thank you! I can't wait either. ;) I have that tool but they still wouldn't budge! You are an amazing talent! Awesome job! Please teach some local DIY classes!!! The cabinet looks great. I'm always up for extra storage. What tool did you use to cut out the piece around the upper cabinet? Your blog has inspired me to tackle DIY projects. I try to have Lowes cut when I can, but sometimes I have scraps to reuse and hate to always be asking others to make cuts for me (hubby is not handy). Any tools to suggest for a beginner? A jigsaw! It's a pretty easy tool to use, it just takes some practice. My cuts are never perfect so I rely on caulk often. ;) A saw, nail gun and jigsaw are my three go-to tools and you can do a TON with them! I wasn't sure if my other comment went through, so I wanted to say that I love the pintuck look and plan to get it for my guest bedroom. I was looking at pintucked bedding on several sites and found nothing under $100. I have a queen bed in there, but I wanted to get a king because I like oversized comforters. I think I would also use the gift card to get some new sheets and accent pillows. I'm glad that Walmart has both a white and gray color option. Love, love,love the pin-tuck look. It just makes the room more inviting and put together, and for the price you just can't go wrong. Also, I had seen the wax warmers but always though they looked bulky, but that one fits perfectly in the room. I definitely have to go out and get one! Anon, I think you meant to put this on the other post, but the comforter set I have and linked to is most definitely a comforter and not a duvet. If you purchase this one online it is a comforter set. I hope you can find one that works! Fabulous job Sarah! How much space in inches is above your top cabinets and the ceiling? I'm also planning on painting my kitchen cabinets white this year, and I want to extend them to the ceiling with mdf. I've considered making cabinets above, but I'd have to find tiny cabinet doors to match the ones I have currently in the rest of the kitchen. I have 18" of space from the top of my cabinets to the ceiling, and I'm wondering if that's enough space for cabinets (cabinet frame space, plus cabinet door). Otherwise, I'll just build an extension and not bother with cabinet doors. But now adays fridges 'breathe' from the front bottom with 100% solid enclosed fridge backs so this is really not an issue.